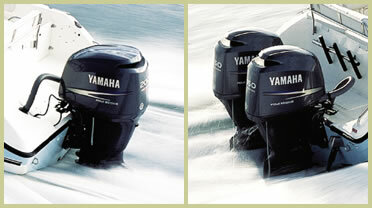 Twins Versus Single Outboard Motors: Which is Better? When saving money is of primary concern, a single makes the most sense. A lone 300-hp motor costs thousands of dollars less than a pair of 150-hp engines and the maintenance costs for two engines will be double those for a single. Count on paying twice as much money for spark plugs, fuel filters and tubes of gear lube. Labor will also be double. Cost savings are just one advantage of a single motor. A single usually runs faster because twin motors, with two lower units, create twice the drag. Twins offer nimbler handling, especially when docking because port and starboard engines can be individually shifted into forward and reverse. A helmsman can steer a twin-screw boat with the throttles never touching the wheel. On plane a twin's counter-rotating propellers track truer requiring fewer course corrections. Then there's safety. Should one engine die, number two engine will get the boat back to port, albeit at reduced speed (not on plane). There is an important exception: bad fuel. When twin engines draw fuel the same fuel supply, both are vulnerable. So with a twin engine installation consider plumbing two separate filter/water separators and fuel tanks. All totaled, a single engine costs less and weighs less while twins cost more to own and operate, but pay big dividends in handling and reliability.